For 18 years in Boulder, then Gunnison, Colorado, Michigan natives Curt and Cathy Brodner ran a specialty machine shop and engineering firm. "Inventors came to us," says Curt Brodner. "We made their dreams reality." But when their younger daughter left for college in '98, the Brodners sold the business, their house and possessions, and flew to Madrid with a tandem bicycle and a Burley trailer. "We bicycled through 27 countries in two years," says Cathy. Stopping over in Thailand, they started several vocational projects in refugee camps, most notably a manufacturing facility for ceramic water filters, porous pottery bowls that filter out bacteria and protozoa. "Water-borne illness is the largest killer of children under age five," says Curt, displaying one of the filters. 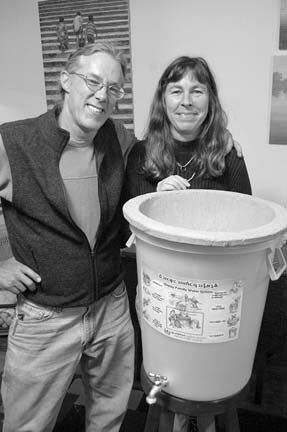 The Brodners settled in Eugene early in 2005, but soon returned to Asia to distribute 6000 filters to the region affected by the tsunami of December '04. With funding from UNICEF, the Brodners established a filter factory in Myanmar in 2006. Another is planned for India in 2008. Learn more at thirst-aid.org.